Nyanga, a sprawling, poverty-stricken illustration of Cape Town’s urban sprawl, Nyanga is one of the oldest Black townships in Cape Town. It was established in 1946 and proclaimed a township during the same year. The township is located on the Cape Flats, sixteen kilometres south of Bellville, Goodwood and Parow and about 26 kilometres from the City centre. It has been established along the N2 close to the Cape Town International Airport and, like most of townships in the country, originated as a result of the migrant labour system - a spillover once Langa was filled to capacity. Nyanga, meaning ‘moon’, has one of the oldest taxi ranks, which has undergone reconstruction to make it safer and more accessible, and is abuzz with energy and a true ‘township vibe’ that has visitors from all over the world taking tours through Langa, Nyanga, Khayelitsha and Gugulethu in an attempt to get a taste of township life. Nyanga is still poor and is made up mostly of informal settlements where people live cheek-by-jowl;(close together; intimately), in shacks made of zinc, cardboard and wood - this despite recent governmental development initiatives to provide more brick houses. Families here live below the breadline. Despite this, Nyanga is where things are happening. Organisations like: 'Abalimi Bezekhaya' are promoting a culture of self-help by facilitating food growing and environmental action, and role models like 'Mama Maphosela', who takes in TB and Aids orphans, are working to deal with the stigma attached to HIV. Vibrant entrepreneurs have opened barber shops, hairdressing salons, tuck shops and informal traders and fruit sellers, line the main streets. Essentially Nyanga was created as a result of the migrant labour system. Initially migrant workers were virtually all men, who needed to earn a wage to pay hut taxes introduced by the government. There were few job opportunities in the rural areas, so they had to come to the cities to work for cash to pay the government taxes. People moved across the country, often far from home, to work for a short while and then return to their families. Later, women, too, became migrant workers, mostly doing domestic work for White families. The migrant labour system provided cheap labour for White-owned mines and farms (and later factories). The system also brought about the racial segregation of land. Phase one of an additional location at Nyanga was completed in 1948. The first 210 houses, later called the Old Location, each had four rooms, a small garden, water and electricity. However there were no floors and walls were unfinished. The weekly rental was 7s 6d compared to about 6d for a squatter shack. Shanties remained licensed following an agreement between the government and local authorities in May 1948. A large number of Nyanga’s first residents came from crowded houses in the inner city. The second phase of Nyanga was completed in 1953 and consisted of 350 dual occupancy units housing 700 families. Residents from the Old Location called this place ‘Mau-Mau’. Nyanga consists of eleven townships: Lusaka, KTC, Old Location, Maumau, Zwelitsha, Maholweni"Hostels", Black City, White City, Barcelona, Kanana and Europe. The Cape Divisional Council (Divco) and Cape Town City Council (CTCC) were the local house authorities responsible for the removals in the Cape during the 1950s and 1960s. 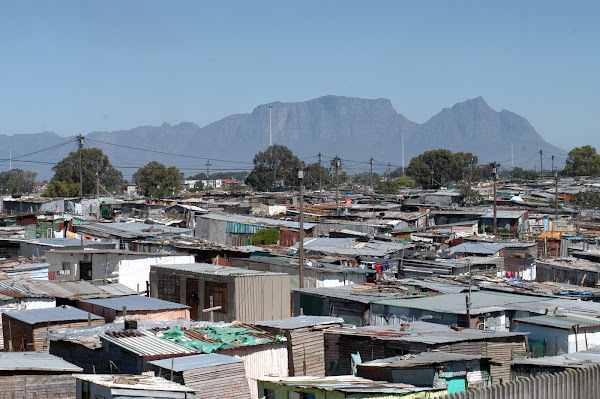 In mid-1952 the municipalities of Goodwood, Parow and Bellville together with the Divco and CTCC made an abrupt decision to move all African squatters in their area to a controlled ‘transit camp’ in Nyanga location. During the same period Divco areas - Goodwood, Parow and Bellville (Divco-GPB) - had 46 ‘black spots’ - an official term used for African freehold land. Among these the largest was at Sakkiesdorp in Phillipi adjacent to Nyanga, which was subsequently incorporated into Nyanga. Others included Cook’s Bush in Grassy Park, Epping Forest, Lot JJ and Eureka Estate in Elsies River, Goodwood Acres, and Oakdale in Bellville. Removals began at Mau Mau, the second phase built in Nyanga in the late 1953. Between 1953 and 1958, an estimated number of 16,000 Africans were evicted from Divco areas. The evictees were moved from shantytowns in these areas to small houses and self-built shacks in Nyanga. From May 1954, police raids were carried out in the Northern suburbs and Africans were ordered to take up single accommodation in Nyanga. The Northern suburbs consisted of Milnerton, Bothazig, Windermere, Goodwood, Bellville and Maitland. In the beginning of May 1956, subsequent to the removals, Nyanga was extended when the Nyanga Transit Camp and the settlement of Mau Mau were incorporated into the township to accommodate migrants and those who came from Langa. By June 1958 almost all African squatters from the Divisional Council areas had been evacuated. Thereafter huge removals took place from Windermere, Retreat, Athlone and other Cape Town City Council areas. These were mainly families who were relocated to Gugulethu and Nyanga. In both Windermere and Retreat the squatter camps were converted into subsidised housing for Coloureds. According to a survey conducted in Nyanga as recently as 1983, it was discovered that of 200 respondents, 90% said they had been forced to move to the area, and 75% did not wish to remain there. Under the Apartheid regime Nyanga residents were said to be very politically active, given the prevalent protests against laws passed that time. The Cape Divisional Council and the Cape City Council, the then local authorities enacted the Natives (Black) Urban Areas Consolidation Act of 1945 (as amended in 1952 and 1955) and the Prohibition of Illegal Squatting Act 52 of 1951. The Natives (Urban) Areas Act made provision for the creation of locations (commonly known as townships). The Act propelled Africans to live in the locations, other than those exempted under section 9(1). On the other hand the Prohibition of Illegal Squatting Act of 1951 was applied to all magisterial regions in greater Cape Town in the year 1952, and the Cape Divisional Council (Divco) officially applied the Act in February 1954. It provided for the establishment of emergency camps and the removal of Africans squatting ‘illegally’ in such camps, as well as the demolition of shanties without requiring a court order. In terms of the Prohibition of Illegal Squatting Act local authorities were compelled to cooperate in establishing emergency camps and demolishing ’illegal’ shacks. This Act was authorized by the then Minister of Native Affairs Hendrik Verwoerd who was responsible for the displacement and dispossession of Africans. During the June 16 Soweto students uprising in 1976, Black students from the townships also participated because the uprising had spread to Cape Town’s Black townships of Langa, Nyanga and Gugulethu. The march was against the use of Afrikaans as a medium of instruction in Black schools. The law was enacted in 1974 by the South African Minister of Bantu Education and Development, M.C. Botha. Protests erupted on 11and 12 August 1976, in solidarity with the students of Soweto. In the early 1980s, Nyanga township became notorious for its faction fighting. A notoriously violent group called the ‘witdoeke’ (white scarfs) emerged. This happened after the local authorities ('izibonda') grouped themselves according to their backgrounds, which they used as their criteria when allocating land. This was followd by cultural disputes. A new era dawned for Nyanga with the removal of the Group Areas Act, Race Classification Act and the introduction of democracy in 1994. The Race Classification Act was in line with thePopulation Registration Act of 1950 which required that each citizen be issued an identity document stating his or her race as either White, Native (African), Indian or Coloured. The Population Registration Act was repealed in 1991.